In a Nutshell: While scholarship and grant money can go a long way toward making college more affordable, some students might be intimidated by the millions of available scholarships and the lengthy application processes involved with many of them. Scholarships.com takes much of the guesswork out of the process by providing students and parents access to more than 3.7 million scholarship and grant applications, while using an algorithm to match students with those scholarships they are most likely to qualify for. The process of applying for scholarships may be time consuming, but it’s well worth the effort if it can reduce student loan debt. College is expensive. Even those attending in-state public universities saw a record average cost of $24,610 per year in the fall of 2016. Luckily, scholarships and grants exist that can ease the financial burden on students and their parents. However, one of the biggest drawbacks of financial aid for many people is that the application process can often be overwhelming and time consuming. For students and parents with busy schedules, it can be difficult to dedicate time to search for scholarships as well as find the energy that it takes to apply. The application process can involve essay composition, video production, audition tapes, and a variety of other tasks to meet the eligibility requirements for each individual scholarship. While there’s no guarantee you’ll win scholarships or grants even if you apply for them, resources are available that can help you determine which ones are worth your time. For example, Scholarships.com is a free financial aid and scholarship website that works directly with scholarship and grant providers and colleges to bring families one of the most widely used college scholarship search sites. “One of the ways we set ourselves apart is that we’ve really tried to develop and foster a relationship with the scholarship providers so that we can offer the best possible outcomes,” said Kevin Ladd, Chief Operating Officer of Scholarships.com. Once upon a time, you’d have to rely on information gathered from guidance counselors or by visiting scholarship fairs, where you might get a one-page list of scholarship offerings, at best. The web has since made the search a little easier, but a basic search still requires a lot of time, and knowing where to begin can be tricky. Because of the sheer volume of scholarships available on Scholarships.com, you have access to a huge variety of awards suited to a variety of student profiles. 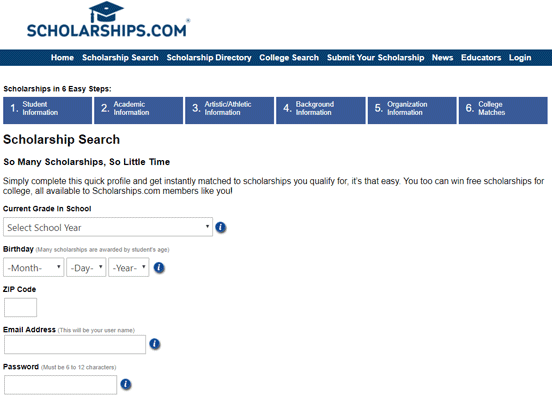 One of the many advantages of Scholarships.com is the ease of finding scholarship matches. The organization works directly with colleges and universities across the country, and the variety of accessible scholarships means users are able to perform highly targeted searches. The free search tool allows you to narrow your search based on your own academic profile, and the whole process only takes a few minutes. While the act of applying for scholarships and grants is laborious, the tailored search feature eases the burden, helping you to forego spending time on those you’re less likely to qualify for. You also might come up with a list of options you’d have never considered. Entering info helps Scholarships.com match students with awards that they are most likely to qualify for. The huge database means you’re gaining access to far more than the typical list of competitive scholarships commonly found online. Instead, you’re searching one of the most comprehensive digital scholarship databases. Scholarships.com employees arrive at the office each day to find a queue of scholarship submissions for review. Submissions come directly from the providers, and employees sift through them to ensure that only quality ones are added to their database. The scholarship application process for the students, on the other hand, is automated and based on an algorithm that matches them according to their profile. Scholarships.com also works with colleges, many of whom are targeting a specific type of student and will award scholarships to those that fit their profile. If students are willing to be flexible about which university they’ll attend, they may receive additional funding directly from the institution. Once you’ve begun to build your list of scholarship options, it can be beneficial to start applying as early as possible. Students and parents sometimes start even before a student’s freshman year in high school. Spending quality time on the application process is well worth it, and if you’re dedicated, you stand to earn much more from scholarships than you might with a typical after-school job like babysitting. Another common misconception is that it’s difficult to win scholarships. This can be true if you’re only looking at the extremely competitive and well-publicized awards, like those from the Bill and Melinda Gates Foundation or the Davidson Fellows Scholarship. 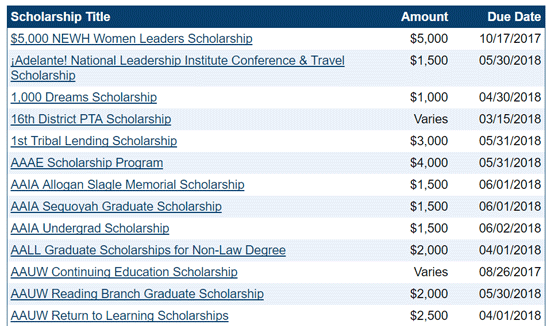 These are a few examples of some of the need-based scholarships available in the scholarship database. With Scholarships.com, however, you can access such a variety of awards that the odds of winning financial aid money can be high if you search for the right awards and are diligent about applying to as many as fit your profile. 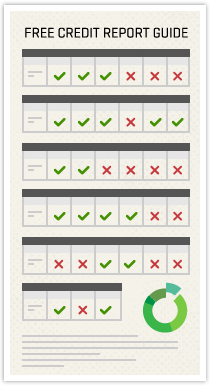 The more time you spend preparing quality submissions, the more likely you are to receive a substantial amount of aid. Applying for scholarships and grants is a lot of work. Funding a higher education without them, however, leads to many students taking on massive student loan debt. And that could take years in the working world to repay, which is probably why about 44 million people owe over $1.4 trillion in student loan debt. Having a database that works to help you narrow down your scholarship options is a great place to start, and the long-term benefits of scholarships and grants should never go underestimated. Scholarships.com helps to bridge the gap between the $19 billion dollars in award money throughout the country, and the students searching for them. College can seem cost-prohibitive for some families, but the advantages of earning college degrees are indisputable. In fact, college graduates earn an average of 65% more than those who graduate high school, while advanced degrees only widen this disparity. By taking advantage of the free search at Scholarships.com — along with some hard work, dedication, and an organized strategy — you can join the millions of students who have benefited from this popular resource since 1998.